Here is a real treat for readers of the Darvish blog, the text of one of Mevlana Rumi’s actual sermons, as recorded in the Majales-e sab’e (The Seven Sermons). We do not know if it dates from before or after his meeting with Shams al-Din of Tabriz. Rumi delivered the opening benediction and the Hadith in Arabic, the liturgical language, then switched to Persian. Only seven sermons are so far known to exist in manuscript form. We are indebted to Franklin D. Lewis and his brilliant, monumental scholarly study, Rumi, Past and Present, East and West: The Life, Teachings and Poetry of Jalal al-Din Rumi, for the translation. Praise be God, who is sacrosanct above compare and contrast, sanctified from all peer and likeness, exalted above death and decomposition; the Ancient of Days, who exists eternally, the transformer of hearts, the motive force behind fate and events, He who brings about revolutions in our circumstances, of whom it cannot be asked when or how long, for the imputation of such concepts to the Ancient of Days is impossible! He began the world without exemplar or precedent, created Adam and his progeny from clods of clay (Qur’an 55:14, etc. ), some of them destined for bliss, some for hellfire, some for remoteness, some for reunion. Among them some are given to drink of defeat while others are clothed with the raiment of acceptance. Should any tongue object, it is dumbfounded by this saying of the Almighty: “He shall not be asked of his doing, but they will be questioned.” (Qur’an 21:23). Exalted is out Lord above contention and disputation! Where does creation derive the right to question and contend? It was non-existent, then came into being and will decompose once again, going as the mountains go: “You see the mountains and suppose them firm, but they will pass away as clouds do. Such is God’s handiwork, who brings all things to perfection” (Qur’an 27:88).”There is no God but Him” (Qur’an 2:163), “the Great, the Exalted” (Qur’an 13:9). He raised up our Prophet, Mohammad (God’s peace and blessings upon him) when ignorance appeared and blasphemy and waywardness reigned, and he counseled his community through words and deeds, making clear to them which paths were forbidden and which were permissible. He exerted himself in the path of God under all conditions until the sea of negation evaporated like a mirage and the Truth was established straight and tall by his effort. God’s peace and blessings upon him and his family – the best of families – and upon his companions: upon Abu Bakr, the righteous, who liberally supported him with his wealth; upon Omar, distinguisher of truth from error, whose obedience to him intensified even in terrifying floods of tribulation; upon Osman, possessor of the twin lights, who held fast to recitation of the Remembrance (i.e. the Qur’an) every morn and every eve; and upon Ali b. Abu Taleb, the smasher of idols and slayer of champions. So long as the gazelle cubs graze in the meadows and the darkness is lit up and wicks blaze, our fervent and humble supplications (for them) will not cease. O Lord, O God, O Sustainer! Wrap us in the light with which you envelop your chosen servants, that we may meet the Friend. Nurture us not in the pastures of lust where you nurture the enemies, where the cows and stable goats are nurtured for their meat and pelts. Nurture the birds of our senses with the grains of knowledge and wisdom that we may fly in the heavens, and not with the seeds of lust, that our throats may be slit. The fickle firmament brings forth its little dramas, just as shadow players manipulate imaginary stars and planetary puppets from behind a screen. We crowd around awhile engrossed by this spectacle, whirling away our night of life. In the morning death will arrive and this throng from the firmaments shadow play will grow cold and the nights of our life will have blown by us. O Lord, before the morn of death dawns, make our hearts cold to this play so that we might escape from the throng in time and not fall behind those who travel through the night. When the morning dawns, let it find us in the precincts of your approval. The water of life is such a thing that whoever drinks from it will never die. Any tree branch turned green by it will never yellow and wither; any flower blossoming by virtue of that water of life will never wilt. But this is not the water of vitality, this is the water of mortality. He who drinks deepest from this mortal water of life will dies soonest. Do you not see how the princes and kings have a shorter span of life than their servants? The branch will soaks up this water most will yellow soonest. See this rose – the one most saturated with this water now blossoming most fully – it will of necessity wilt before all the other brides of the garden. Rare is the body whose ear hears this cry and counsel, and rarer still the somebody who leaves this murky water to the nobodies. O God! O Monarch! Make us one of those somebodies and grant us deliverance from this black and brackish water, that we may not die like those others with swollen face and bloated belly at the fount of this spring and may not be held back from the quest for the water of life. So Abu Dharr said: This great one (Mohammad) emerged one day from the Sacred Mosque and the place of prayer from which he called his Lord. He said, “Supplication after the obligatory are always answered.” He mounted the throne of “I am the chief of the sons of Adam but take no pride in this.” He spread the carpet of “Poverty is my pride,” and set out the cushions of “Adam and the other prophets are under my banner,” reclining upon the support of “the first thing God created was my light.” Those who accompanied him from Mecca and those who supported him in Medina and all those “who seek forgiveness at dawn” (Qur’an 3:17), those who in gratitude “stay up through the night and fast during the day,” drew around him a circle. There was the righteous Abu Bakr, who like a jeweler, set forth pearly words of divine mystery in fine array. There was the Discriminating Omar, divining the distinction between truth and falsehood. There was Osman of the Twin Lights, preparing light for the darkness of the tomb. There was Ali the Acquiescent, forging bonds of contentment. There was Belal, singing like a bulbul. “Rejoice us with the call to prayer), O Belal!” Sohayb was there, quaffing the chalice of the wine of faithfulness. Salman was there pacing in the path of peace. And I, Abu Dharr, was there, reduced to a mote of dust before his majesty. I brazenly opened my mouth and asked our great leader (in Arabic), “What is in the scroll of Moses?” (Meaning in Persian) What is in the scroll of Moses, that consolation of the soul of lovers and the confidant of yearning hearts? Our leader, at the command of the One Who lives and never dies, removed the seal of silence from the treasure chest of truth, and said: (Arabic) “I am amazed.” (meaning in Persian) I am amazed by the servant of God who has set foot in the field of faith, has believed in Hades and all the levels of hell, has heard the call of King and His aides; how can he, in this thicket of calamity and prison of catastrophe, laugh lightheartedly? No, no, my brother! Try to escape from this prison, set foot on the path of repentance so that you may have both the here and hereafter in this world. But what good is this? Rather you should set your sights even higher and spur on the steed of religion even faster until you pass beyond all regard for the world and even close yours eyes to the next world. In this way you will see the beauty of the mysterium tremendum. Sweep all away with the broom of “No!” Every king or prince has a herald for every ceremony. The herald which sweeps aside both worlds from before the face of the Courtiers and Kings of Holiness is the phrase: THERE IS NO GOD BUT GOD. Look on nothing but God’s beauty, hear nothing but God’s word, that you may be among the closest confidants of the King. My idol, seeing this, reproved: For shame! Here is my cheek and you look there at the rose? And God is the All-Knowing. The Night of Power will be, inshAllah, on August 15th this year for those countries that started fasting on July 20th, and August 14th for those countries that started Ramadan on July 19th. 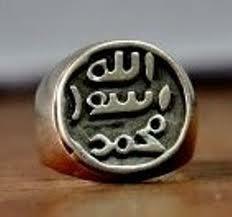 In the last ten day of Ramadan, I have been contemplating the seal ring of the blessed Prophet (saw). The inscription reads “Muhammad Rasul Allah,” meaning literally: “Muhammad is the messenger of Allah.” This is the inscription on the original seal that was used by the Prophet, may Allah bless him and give him peace, to sign the letters he sent to various rulers. The Prophet, may the peace and blessings of Allah be upon him, was illiterate, so he had the ring made as his signature seal. And indeed, The Prophet (saw) had the ring cast in silver, but being so filled with love and reverence for Allah almighty, did not want to place his name above the name of Allah. Contrary to the normal way of reading from top to bottom, he had the inscription written upwards, “Muhammed Rasul Allah” as can be seen in the photo above. The original ring, however, was lost down the well of Aris during the reign of hadhrat Uthmaan. The Seal that is in the Topkapi palace was made thereafter, and is not an exact replica of the orignal, which was never recovered, according to this hadith. Nonetheless, may Allah hear our prayers and bless us these last days of Ramadan with the love and humility of the Prophet (saw). Amin. You are currently browsing the Darvish blog archives for August, 2012.